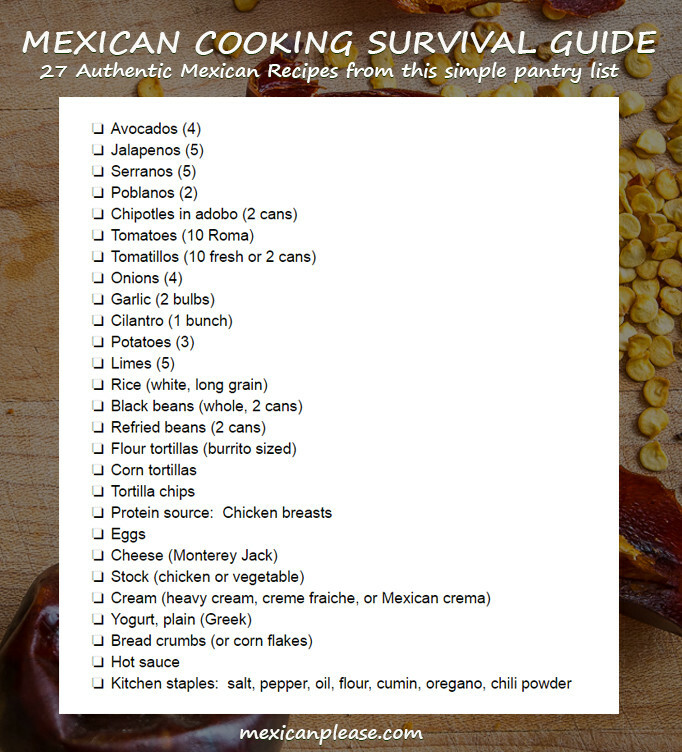 Here are the ingredient tips for the Mexican Cooking Survival Guide. I’ll put a pic of the ingredient/pantry list below but there’s also a free PDF of the list here if you want to print it out. There’s a good chance you can find all of these items at your main grocery store, but that depends a bit on the store. Sometimes you’ll need a backup specialty market for items like poblano peppers and chipotles in adobo. Of course, if you have a Latin market close by than you are lucky as they will have just about everything. I tend to buy the produce and more common items from the big grocers and rely on my local Latin market for the more specific items. If you don’t find everything at first, don’t give up! Sometimes you’ll find items in strange places so it’s always worth asking if you’re coming up blank on things like Chipotles in Adobo. I’ll list item amounts for two people but you can adjust accordingly for family size kitchens. The easiest way to keep fresh avocados on hand is to let them ripen on the countertop (until brown and slightly smooshy) and then put them in the fridge. This halts the ripening process and they will keep for an additional week or so. Your new best friend! Buy the ones that are green and taut. Most areas have fresh jalapenos year round, but sometimes you have to check a couple different markets. Here’s a comparison of the main peppers you’ll be using. The numbers listed are Scoville Heat Units; the higher the number the hotter the pepper. I tend to store chili peppers in a large ziploc in the fridge where they keep for 1-2 weeks. Serrano peppers look like skinny jalapenos. They are significantly hotter than jalapenos and have a sharper, grassier taste. Most importantly, please know that you can always use jalapenos in place of serranos and the difference is minimal. For example, Salsa Verde is typically made with serranos, but I’d say 75pct of the time I make it I am using jalapenos. So don’t fret if you can’t find serranos, just use jalapenos! These are a bit tougher to find in certain areas. Buy the ones that are dark green and have taut skin. Note that smaller chili peppers tend to be hotter than larger varieties. 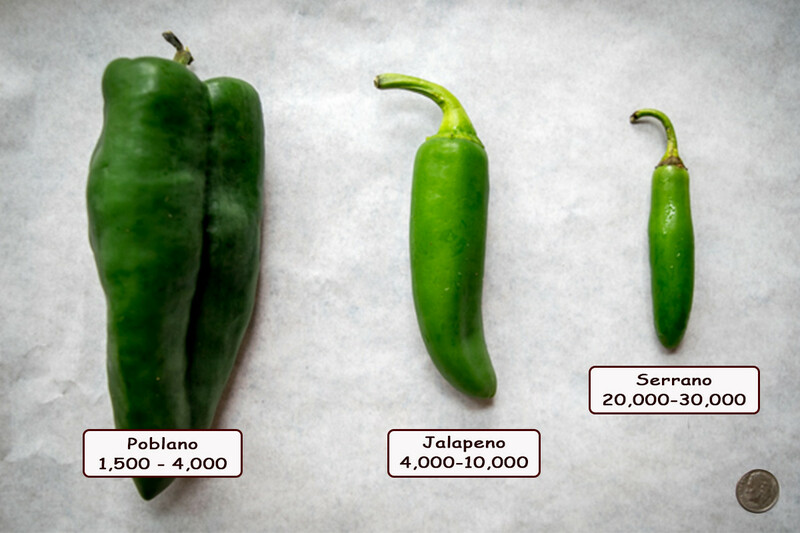 So in this case, you’ll find that poblanos are surprisingly mild compared to the smaller jalapenos and serranos. But when they are roasted they have a unique flavor that is all their own. These are dried jalapenos swimming in a tangy sauce. The result is a smoky sweet pepper that does wonders in salsa and dishes like Chicken Tinga Tacos. You’ll find them in some of the bigger grocers and in all of the Latin markets. After opening a can, I store the peppers in a small tupperware container in the fridge. I usually stick with Roma/plum tomatoes because they have a more favorable flesh to seed ratio, but ‘normal’ tomatoes work just as well. 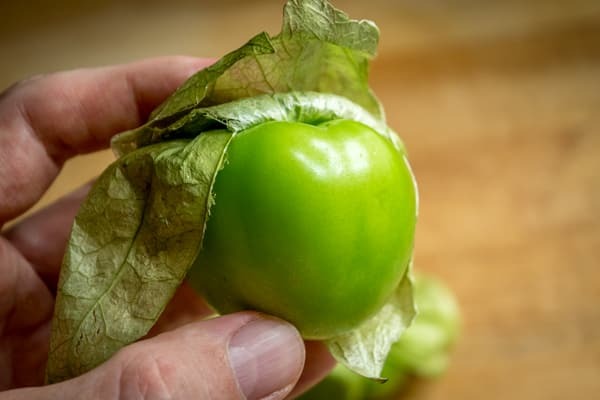 Tomatillos are the heart of the green sauces you’ll be making. You’ll find them in the produce section of most markets, usually tucked in next to the jalapenos. Take a peek inside the husk and buy the ones that are taut and greenish. If they are overly wrinkled they are past their prime. If you can’t find fresh tomatillos then buy canned tomatillos from a Latin or gourmet market. You’ll go through lots of onions. White or yellow will do. White onions are slightly sharper and yellow onions will be slightly sweeter. I use white onions out of habit. Buy heads of garlic that are firm. The fastest way to peel a single clove of garlic is to cut off the top stem portion and then lightly smash the clove with the flat blade of a knife. If you are a pro smasher the skin will then pull off in one piece. Cilantro adds a freshness to Salsa Verde and other sauces that you can’t get from any other herb. The only downside is that it can be difficult to store. I keep it in some water (Mason jar) in the back corner of the fridge with a plastic bag loosely covering it. This will keep it usable for up to 2 weeks. I tend to use Russet potatoes but you can get by with just about any potato you have on hand. Limes cost a nickel in many parts of Mexico. Not so north of the border, so it’s worth price checking the options in your neighborhood. Sometimes the specialty or Latin markets will sell them 5 for $1 or something similar. Store in the refrigerator. White, long-grained rice is the most common rice used in Mexican cuisine. Yes, eventually you might cook your own batch of beans, but it’s worth keeping a couple cans of black beans in the pantry. Most of the recipes in the Guide will be flavoring the beans so buying the cheap ones is fine. Soon you’ll be an expert on making your own refried beans, but keeping a couple cans in the pantry is a good option for those days when you are short on time. Your default market will have adequate flour tortillas. Store in refrigerator. One package will do. White or yellow corn tortillas from your default supermarket will be sufficient. But if you have a Latin market near you then check to see if they stock any tortillas from local producers as sometimes these can be a slight improvement. Store in refrigerator. 1-2 packages. Once you are in the habit of making your own guacamole in a matter of seconds, it’s always good to keep a bag of tortilla chip close by. And if nachos are in your future, the thicker, heartier chips will serve you better. Chicken dominates in my kitchen so most of the “meat” dishes in the Guide will use chicken. The good news though is that most of the recipes will work just as well with your preferred protein source, so feel free to get creative with your choice of tofu, pork, lentils, beef, etc. Having eggs on hand gives you instant access to some mouthwatering breakfast dishes that work great as dinner too. Any melting cheese will serve you well in Mexican dishes, but Monterey Jack cheese is a great default cheese to always have on hand. Cheddar and Mozzarella are decent substitutes. You’ll also see Cotija cheese mentioned occasionally. 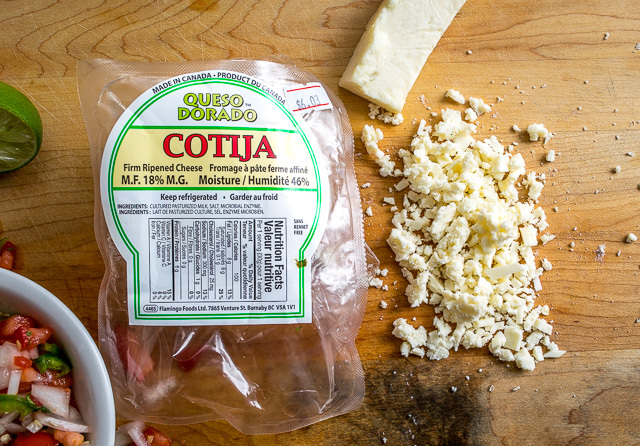 Cotija is a salty, crumbly cheese that is a great final (optional) garnish on many dishes. Don’t fret if you don’t have any on hand as it’s not required, but definitely keep an eye out for it in your neighborhood. Having chicken or vegetable stock on hand will improve the flavor of your Mexican sauces. You’ve got lots of choices on stock. A low sodium storebought version will suffice in most cases. You’ll get a slight improvement buying in-house stock from your local butcher or gourmet store. And of course, you always have the option of making your own. Note that in most cases when stock is called for, you always have the option of substituting water if your kitchen is stockless and you’ll still get a good result (although slightly inferior). We are mostly using cream to enhance sauces, i.e. Enchiladas Suizas, so keeping a pint of heavy cream on hand is the easiest solution. But creme fraiche and Mexican Crema are in the same realm, so they can be used as well. Note that heavy cream holds up best under high temps and is the traditional choice when cooking or simmering is involved. Mexican Crema is traditionally used as a topper; a final drizzle over a completed dish. Having some yogurt on hand will give you the option of making ‘light’ versions of some of the sauces we’ll be using. For example, you can make Chipotle Mayonnaise using all Greek yogurt in place of mayonnaise and most people won’t notice the difference. You’ll only need these on hand if you want to make Milanesa cutlets: breaded chicken cutlets that can be used in tortas, tacos, etc. 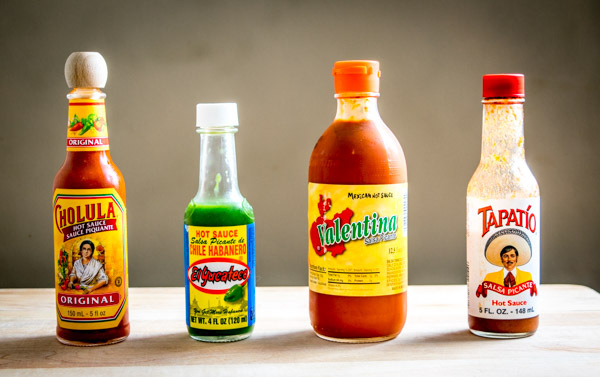 My default is Valentina hot sauce, here’s why. Other good choices include Cholula and Tapatio. Your kitchen probably already has all of these on hand: cumin, oregano, chili powder, salt, pepper, oil, flour, mayo.